PURPOSE: Epidermoid and dermoid cysts are extremely rare developmental cysts of a benign nature, which may occur anywhere in the body, although about 7% are found in the head and neck. 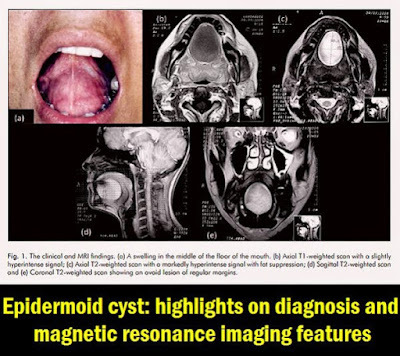 This article reports a clinical case of a patient who had an epidermoid cyst and its magnetic resonance imaging (MRI) features. CASE REPORT: This case discusses an epidermoid cyst in a 36-year-old woman complaining about speech difficulty. Clinical examination revealed an extensive swelling on the floor of the mouth. MRI findings showed a cystic homogenous lesion located underneath the mylohyoid muscle which was removed by surgery. Histological examination of the mass confirmed the diagnosis of an epidermoid cyst. CONCLUSION: We concluded that MRI was considered useful for a more accurate diagnosis prior to treatment. Epidermoid and dermoid cysts are extremely rare developmental cysts of a benign nature, which may occur anywhere in the body, but most predominantly in the ovary and scrotal regions. Only about 7% are found in the head and neck. The occurrence of such cysts in the oral cavity is extremely rare, with approximately 1.6% located in this area. The floor of the mouth is the most commonly affected area, however, these cysts can also be found in the tongue, lips, buccal mucosa and jaw and mandible bones. 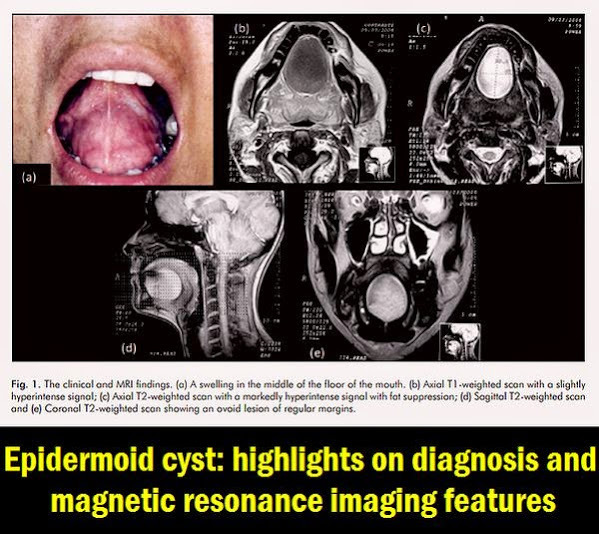 Because of the difficulty of making a correct diagnosis of these lesions when using clinical examinations and conventional radiological images, it is recommended that specialized imaging examinations should be used, such as ultrasonography (US), computed tomography (CT) and Magnetic Resonance Imaging (MRI).We describe a case of a patient who had an epidermoid cyst and discuss features such as age of occurence, anatomic location, differential diagnosis and imaging findings. A 36-year-old female patient was referred to the Head and Neck Division of the Araújo Jorge Hospital (Association of Cancer Combat of Goiás), Goiânia-GO, complaining mainly about “a growth in her mouth that had affected her speech”. The patient stated that the lesion had appeared two years ago, was painless, but was causing progressive speech difficulty. During the intrabucal clinical examination, good dental conditions were noted as well as a swelling measuring 5 x 4 cm, located in the floor of the mouth. The initial diagnosis was the possibility of a salivary gland lesion.